Roger Federer won his first tournament in 10 months when clinching a fifth Swiss Indoors title in Basle. The Swiss, currently ranked fourth in the world, outclassed Japanese youngster Kei Nishikori 6-1 6-3 to win the event for the fifth time in six years. Nishikori had beaten Novak Djokovic in the semi-finals but was unable to repeat the heroics against Federer, who remains a force in the game at 30. He advertised his full repertoire of strokes in winning his 68th career title, in what was his first final appearance since losing to Rafael Nadal in the French Open. The third seed dropped just one point on serve in a demoralising opening set for the wildcard, who was unable to gain a foothold in the match, with Federer breaking crucially in the sixth game of a more competitive second set. 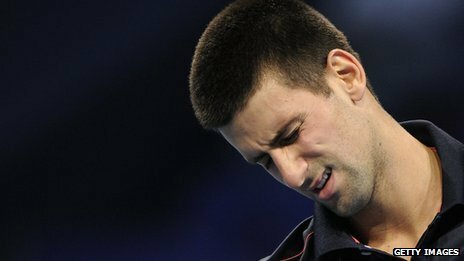 Novak Djokovic suffered only his fourth defeat of the year as he lost to Japan’s Kei Nishikori in the semi-finals of the Swiss Indoors in Basel. Ryan Sweeting won his first ATP Tour title by beating Kei Nishikori in the US Clay Court Championships final. The 23-year-old American wild card saw off the Japanese sixth seed 6-4 7-6 (7-3) in Houston. Sweeting, trailing 5-4 in the second set, had to overcome three set points on his own serve before holding on a lob error by Nishikori. In the tie-break, he double-faulted to make it 3-3 but two errors by Nishikori saw him close in on victory. A forehand volley winner by the brought the contest to match point and it ended when a Nishikori forehand skipped wide. Sweeting’s win capped a fine week’s work which also saw him defeat second seeded compatriot Sam Querrey and former champion Ivo Karlovic. He is the first wild card to reach the Houston final since Mardy Fish won in 2006 and the fifth first-time winner on the ATP Tour this year. Sweeting fell to the ground in jubilation and fatigue after a hard-fought second set and later took a victory dive into the pool at the Oaks Country Club. Sweeting will move up to a career-best world ranking of 71st after his win. Sweeting and Nishikori reach the Houston semifinals. Ryan Sweeting reached his first ATP World Tour semi-final after he defeated Teymuraz Gabashvili of Russia 3-6, 6-3, 6-1 in one hour and 41 minutes. World No. 93 Sweeting, who dropped one point on serve in the deciding set, converted five of seven break point opportunities overall to improve to an 8-6 match record on the season. Uruguay’s Pablo Cuevas advanced to his first semi-final since Moscow last October when he won his first meeting with doubles partner, Spaniard Guillermo Garcia-Lopez, 1-6, 7-6(4), 6-3. Former World No. 14 Cuevas has slipped to No. 75 in the South African Airways 2011 ATP Rankings. He next plays Japanese sixth seed Kei Nishikori, a surprise 6-3, 6-2 winner over top-seeded American Mardy Fish. Fish, who won his lone ATP World Tour clay court title in Houston in 2006, hit just one ace and did not earn a break point on Nishikori’s serve. At No. 11 in the South African Airways 2011 ATP Rankings, Fish would have broken into the Top 10 for the first time in his career had he won a second Houston title. Nishikori was appearing in his first ATP World Tour quarter-final on clay. Nishikori joins Fish in the Houston quarters. Top seed Mardy Fish breezed into the quarter-finals of the US Men’s Clay Court Championship in Houston on a day when all the seeds in action won. Fish beat Albert Ramos 6-3 6-4, saving eight of nine break points in the match. Third-seeded Guillermo Garcia-Lopez topped Indian Somdev Devvarman 6-4 6-1 to seal his place, while Kei Nishikori, the sixth seed, beat Igor Andreev 6-3 6-3. Wild-card James Blake saw his tournament ended with a 7-5 6-1 loss to number seven Pablo Cuevas. Kei Nishikori advances to take on Rafa in round two. Bulgarian qualifier Grigor Dimitrov, another upcoming talent on the ATP World Tour, did not fare so well in his first-round match as he was beaten by Ukrainian Sergiy Stakhovsky 6-2, 6-4 in 68 minutes. The No. 36-ranked Stakhovsky broke serve four times from nine opportunities as he recorded his 10th win of the season and set a second-round meeting with No. 32 seed Juan Monaco. Two Spaniards came through three-set tussles to book their place in the second round. Left-hander Feliciano Lopez fired 19 aces as he fought past 20-year-old Lithuanian Richard Berankis 4-6, 7-6(5), 6-3 in two hours and 26 minutes, while Ruben Ramirez Hidalgo needed two hours and 40 minutes to get by France’s Adrian Mannarino 7-6(3), 6-7(3), 6-2. Ryan Sweeting upsets Sam Querrey 7-6 (7/5), 6-4 to reach the quarter-finals. Sweeting, ranked 118th, advanced to a Friday date against Japan’s 66th-ranked Kei Nishikori who breezed past American wild card James Blake 6-3, 6-4. Nishikori’s only ATP crown came at Delray Beach in 2008. French eighth seed Adrian Mannarino advanced to the second round by rallying to defeat Argentina’s Leonardo Mayer 1-6, 7-6 (7/3), 6-4. Mannarino will next face Colombian qualifier Alejandro Falla and could meet US second seed Mardy Fish in the quarter-finals. Fish is the highest-ranked player in the field after US top seed Andy Roddick withdrew due to illness. In the night match, sixth seeded Janko Tipsarevic outlasted Blaz Kavcic 6-2, 6-7 (8/10), 6-3. Nishikori attributed his victory to his new coach Brad Gilbert. Marin Cilic’s preparations for the Australian Open suffered a setback on Monday when he was knocked out of the Chennai Open in the first round by Kei Nishikori. The Croatian, who came into this week’s tournament as the two-time defending champion, lost 4-6 7-6 (7-0) 6-2 to his Japanese opponent who, at 98th in the world, is ranked 84 places lower. Cilic, who was seeded second this week, broke Nishikori in the fifth game to take the opening set but the latter then turned the match on its head. Nishikori, who also defeated Cilic at last year’s US Open, fought back in a dramatic second set in which he saved three break points in the 11th game. The 21-year-old won the tiebreak without dropping a point and then broke Cilic in the first game of the third set to take an early grip on the decider. He served out for the match after breaking again in the seventh game. “I’m a little bit disappointed the way I have started the year. I wouldn’t say I played too bad … I didn’t have luck at crucial moments, the key points he played better than me,” Cilic said. “The first two sets were very close. (My) losing the second set, he took the momentum from me,” he added. “The momentum he got, the way he played after that, I could not come back.” The Florida-based Nishikori attributed his fightback to changes he has made to his game under the auspices of new coach Brad Gilbert. “I was nervous, first match for me … new coach, new trainer. (But) it was a good match today,” he said. He will be joined in the second round by America’s Robert Kendrick, who was a 7-6 (7-1) 6-4 winner over Germany’s Denis Gremelmayr. Bjorn Phau was a 6-2 6-2 winner over Italy’s Simone Bolelli, while Croatia’s Ivan Dodig defeated Marcos Daniel by the same scoreline. Serbia’s Janko Tipsarevic is also through after a 6-3 6-4 win over Argentina’s Eduardo Schwank, and France’s Stephane Robert secured a 6-4 6-4 success against Andreas Haider-Maurer. 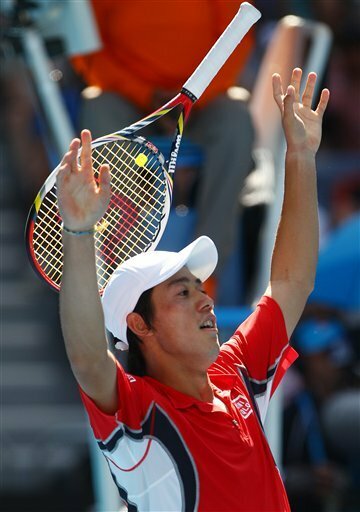 Kei Nishikori teams up with Brad Gilbert for 2011. Gilbert, who is currently a guest coach at Nick Bollettieri Tennis Academy, will be his new traveling coach and mentor. Kei Nishikori will be expanding his IMG Academies coaching team with a consulting role for Brad Gilbert. Gilbert , where Nishikori trains year-round under the tutelage of legendary coach Nick Bollettieri and his world class staff. Gilbert has led Andre Agassi to six Grand Slam titles and also coached Andy Roddick and Andy Murray.